So you need a new TV? Then you need this TV buying guide. Maybe your current one has crapped out, or become embarrassingly old, or you want something flash to watch World Cup 2018 on. Either way it’s time for an upgrade. But what screens should you shortlist, and how do you make sense of the explosion of new technologies and features competing for your cash? Don’t just aimlessly window shop. Know what screen size you need, decide which features are important and do your display tech homework. If your current TV is more than a couple of years old, you'll probably find things have moved on a lot in terms of quality and whizz-bang new features, from 4K to HDR to better smart TV systems. Screen size is simplest but also the most contentious of TV buying parameters, and it’s where so many get it wrong from the off. That's why we're kicking off this TV buying guide right here, tape measure in hand. You can get your own tape measure out and use the old 'rule' about buying the 'correct' size of screen for your front room – supposedly you should be sat a distance away that is the screen width multiplied by between 0.8 and 2.7 depending on screen resolution. But while we regularly hear punters moaning their regret about not buying a larger TV, we very seldom hear of similar remorse over getting one that is too big. Take our word for it, if your last TV, bought in 2010, say, was a 43-incher, don’t get a direct replacement. Todays TVs are dramatically smaller. A 2018 43-inch TV placed in the footprint of a comparable model from 2008 will look comically small. Fact: your new TV will be bigger than your last. The only question is by how much. We have a simple rule of thumb. Mull over what your room can take, come to a consensus with your partner, finally, categorically decide on a screen size...and then buy the next size up. It’s worth noting that that there’s a direct correlation between screen size, viewing distance and perceived resolution. Typically, if you replace an HD TV with a UHD one of the same size, but don’t change your viewing distance, you won’t see an improvement in resolution. Either buy a larger UHD TV than your old HD one, or stay the same and pull your sofa nearer. When should you buy a new TV? If you're reading this at publication, in April, NOW is the best time, or at any rate over the next couple of months. That's because you have the choice of last year's top TVs at greatly reduced prices, or this year's models at, uh, not-reduced-at-all prices. Say you're in the market for an OLED. Right now you can buy a brilliant LG B7 or C7 (they're essentially the same TV with cosmetic differences) for under £1,500 at 55 inches or under £2,500 at 65 inches. However, 2018's upgrade, the LG B8 or C8 is coming in at over £1,000 more. The question is, would you prefer the latest and greatest, or a fantastic deal on something older? New-year pricing varies across brands and models, though. 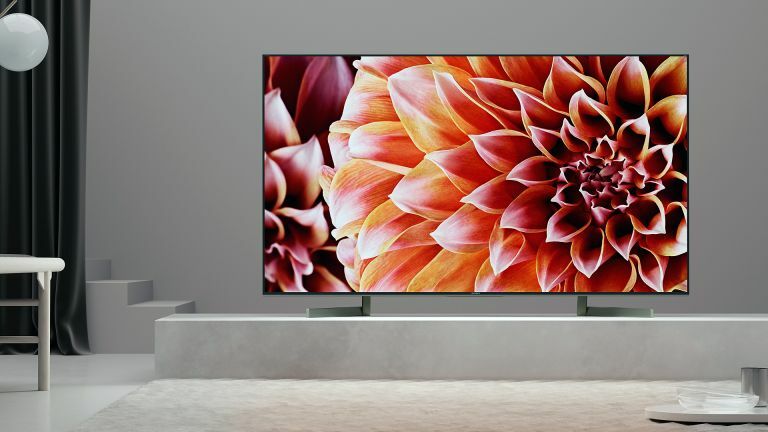 Sony's new AF OLED screens directly replace 2017's superb, T3 Award-winning A1 55- and 65-inchers, use the same panel (but with presumably improved processing) and will launch at prices that are pretty similar to what you can currently get the older models at. However, give it another month or so and you could see the 2017 Sony flagships drop even further in price, at which point they'll be a very alluring prospect. At the absolute top end, you can now get a jaw-dropping LG G7 77-incher with a discount of £12,000 on its original RRP. 12. Thousand. Pounds. Though It still isn't cheap, we'll grant you. How much should you spend on a new TV? We won’t presume to tell you that, but realistic budgeting will help you find the right telly. Particularly when talking about original RRP, not all TVs are created equal, and you get what you pay for. Our only advice is this: don’t be one of those people that budget £1,500 for a leading-edge TV, only to impulse purchase an entirely unsuitable one simply because it’s being advertised on sale for £350. As our buying guides show, you can get a very good TV for £500 and below, and an excellent telly for under £1000. But if you want the best TV, you will need to go through the psychological four-figure-sum barrier. Know your screen tech: OLED or LED? 4K or full HD? Nowadays, there are just two display technologies competing for your eyeballs: LED (Light Emitting Diode) backlit LCD and OLED. QLED, as used by Samsung, is a variant of LCD. OLED is fast becoming the fan favourite screen tech, and up to now it’s only been available at the higher end of the market. Booming demand and a limited production capability (LG Display is responsible for all the panels in circulation) will ensure that won't be 'cheap' for the foreseeable future but prices are way lower than they were a few years back, and this year will see a few sub-£1000 OLED screens from, shall we say, less well-known brands. It’s easy to see why OLED is so popular. Because the individual LEDs light themselves, no backlight is required. Display characteristics include a perfect inky black performance, vibrant wide colours and a wide viewing angle. By comparison, LCD ships in a bewildering variety of flavours. The most common LCD TVs are edge-lit, but there’s a growing number of full-array backlit models around too. The former are commonplace and often cheap, but tend to suffer from greying blacks and uneven, splotchy tonality. Full-array models have better lighting control, and offer more convincing blacks. They're more like OLED, in short. What of QLED, Samsung’s much hyped screen tech? The Q in QLED refers to Quantum Dot (QD), and refers to a QD filter which covers the LED backlight. This improves colour performance, extending the range (or 'gamut' if you want to be technical) of the panel. Samsung says its latest QLED models can cover the complete DCI-P3 colour spectrum, as used by Hollywood movies. Rival screens manage around 90 per cent, give or take. The choice between 4K UHD and full HD 1080p is simple: go for 4K. Other than at small screen sizes bellow 55 inches, the extra resolution (four times that of 1080p) is well worth it. The best 4K TVs do a great job of upscaling HD films and TV, and the amount of native 4K content is growing fast after a slow start. HDR is also found only on 4K TVs, too, apart from a few HD exceptions, usually from Sony, and aimed at PS4 gamers. On the same topic, perhaps the simplest way in which OLED differs from the various rival LCD models is the way it displays HDR (High Dynamic Range) content. HDR (High Dynamic Range) has been hailed as the next step up in the evolution of TV picture quality. If 4K gave us images with four times the pixel density of fusty old full HD, HDR produces images with a more naturalistic dynamic range. HDR TVs should (theoretically) be able to present images with bright spectral highlights; reflections should glint and the sun should glare. HDR is a boon for sports coverage too. With a wider dynamic range, broadcasters can expose a football stadium to show both detail without the shadows, without washing out the sunlit pitch. That's something to bear in mind if you're shopping for a TV to watch the World Cup on. There’s no shortage of HDR content to watch, as it's become a standard fixture on UHD Blu-ray, as well as Netflix and Amazon Prime Video. Broadcast HDR is lagging behind but that may change soon. But here’s the rub: there are TVs which claim HDR compatibility at virtually every price point, but they do not offer comparable viewing experiences. To signpost this, the UHD Alliance (a conglomeration of studios, TV makers and chip vendors) came up with a certification that it calls Ultra HD Premium. Created in collaboration with the Consumer Technology Association, Society of Motion Picture and Television Engineers and International Telecommunications Union, it’s a benchmark for HDR quality. The Ultra HD Premium badge can be applied to LED LCD TVs which offer more than 1000 nits peak brightness and less than 0.05 nits black level, or OLED TVs which have 540 nits peak brightness and dive to 0.0005 nits black level. The disparity reflects the fact that OLEDs go darker, while LED TVs are 'less black', but go brighter. A certified display must also be able to achieve 90 percent of the DCI P3 colour space. All new OLED screens meet or exceed this criteria, typically hitting 750 nits or higher, but LED LCDs are less compliant. It doesn’t help that some manufacturers, notably Sony, don’t subscribe to the standard at all. A nit, also known as candela per square metre (cd/m2), is a measure of brightness. Cheap TVs which claim to be HDR compatible, but don’t have the light output to deliver bright highlights (often maxing out at 350 nits), will recognise an HDR signal but don’t have the wherewithal to do much with it. A technique called tone mapping is used to match an HDR source with an HDR display, but the results can be highly variable. Our advice is this: don’t buy a budget HDR TV and expect it to offer anything like the picture performance of a mid-to high-end model. In many instances, the cheaper set will actually make HDR content look unacceptably dark. Consequently, if you end up buying a sub-£500 HDR compatible TV, don’t be surprised to find it looks best with standard dynamic range content. There are various flavours of HDR which use either static or dynamic metadata to tone map HDR images. The former has a preset value which doesn’t change, while the latter optimises HDR on a frame-by-frame basis. If you have a TV genuinely capable of deep blacks and high peak brightness, there’s less need to tone map, so any differences between the two techniques becomes less acute. HDR10 is the standard static form of HDR. It's used for all HDR sources and all HDR TVs comply with it. Dolby Vision is a proprietary dynamic metadata standard, and can be found on some UHD Blu-rays and Netflix shows (depending on the Netflix client used). HDR10+ is an open dynamic metadata standard intended as a rival to Dolby Vision. It's yet to gain any commercial traction, although it boasts heavyweight support from Panasonic, Samsung, Warner, Fox and Amazon. What's the best Smart TV platform? While all the TVs you’ll covet will be network connectable, the smart platforms they use differ a bit. Given that that you’ll be living with your TV’s interface for some time, it's wise to make sure your choice works for you. All connected TVs tend to offer Netflix, Amazon prime Video and YouTube as standard, plus broadcast catch-up TV from the BBC, ITV, C4 and C5. Arguably the best smart TV platform around at the moment is webOS, which is found on LG connected screens. It’s intuitive and powerful, with a host of clever features including 360 video playback from YouTube and a picture gallery for when you're not actively watching. Panasonic’s My Home Screen is similarly minimalist, and impressively customisable. Samsung’s Tizen interface borrows liberally from both, and is getting a refresh for the 2018 season. The odd duck is Android, as employed by Sony and Philips. Not to be confused with the Android experience on a smartphone, it’s visually cluttered and prone to crashes and flibbles. On the plus side, it has Chromecast built-in and will work with Google smart speakers. The tuner to look out is Freeview Play, which is the latest version of terrestrial Freeview. This offers seamless integration of web-delivered catch-up TV services and a roll-back 7-day programme guide. Freeview Play has been embraced by all TV manufacturers with the curious exception of Samsung. Audio performance is a huge differentiator when weighing up TVs. For the most part, a thin flat panel will only provide you with a functional noise, so you may well want to add one of the best soundbars or AV receivers. TVs with a forward facing sound system (often referred to as an integrated soundbar) tend to sound much better than those with tiny, downward firing drivers. If you can see speakers on a set, it’ll almost inevitably sound better than one where you can’t. I only say 'almost inevitably' because there is one exception. Sony’s Acoustic Surface technology, as used on the brand’s A1 and AF8 OLED TVs, actually turns the panel itself into a speaker, which vibrates to generate really quite powerful audio. Tiny actuators fixed to the rear of the OLED screen work in tandem with an onboard woofer to produce full bodied sound. Select LG 2018 TVs have a Dolby Atmos decoder, which is a unique bonus. While the sets themselves don’t really benefit from this, the decoder means you can route the Atmos bitstream out of the TV using HDMI ARC into a Dolby Atmos soundbar or AV receiver, and make full use of this advanced immersive audio system. If you’re an avid video gamer, you’ll want a TV with low input lag; this will ensure that response times are fast and your friends don’t get the drop on you during a frantic Fornite frag fest. Most sets have dedicated Game modes, and while these often perform better than regular TV image presets, they vary dramatically. Sony’s 4K 55-inch XF90 has an input lag of 39.3 ms in Game mode (an improvement on the 95.8 ms in Standard mode), but this compares poorly with the 50-inch Panasonic EX750, which has an input lag of just 14.1ms in Game mode (down from 102.4 ms in normal mode). We reckon 30 ms or less can be considered a good input lag figure for a TV. Of course, lag discrepancies are less significant if you’re a Minecraft fan, as opposed to a first person shooter addict. While most TVs take a cookie cutter approach to design, with narrow bezels and lookalike pedestals, there are some TV makers prepared to offer something different. The most stylish brands are Loewe and Bang & Olufsen, both of which have a more avant garde approach to TV design. Bang & Olufsen recently introduced a Wood Edition of its high-end Hi-Fi OLED Eclipse TV, with a handmade oak speaker cover. It’s pricey but rather splendid. Philips offers Ambilight, a multicoloured backlight mood system that mirrors the colours on screen. It also now interfaces with Philips Hue smart lighting. You might also want to consider a curved set rather than flat. Bends were all the rage a few years ago, but they’re rather fallen from favour, with only Samsung left enthusiastically flying the flag for curved models. Remember, while the viewing experience can be immersive, there’s really only one central sweet spot on a curved TV, and the panel itself picks up a lot of weird reflections in lighter rooms. A good curved TV can look spectacular but in almost all circumstances, we'd rather have a flat screen of the same price. Today's best deals on T3's choice of the best TVs of 2018. You’re now ready to venture forth and audition your next TV. With our advice rattling around your noggin, you can’t possibly buy wrong.